The student used their background in graphic design to create a graphic seemingly identical to Campus Dining’s original. There are many things that students might expect to read on the comment and question cards that are attached to napkin holders, but the phrase “Does it look like anybody here cares?” is probably not one of them. However, in the weeks leading up to winter break that is precisely what a few eagle-eyed students noticed in McGauvran hall. It appeared that someone had replaced the cards on a few napkin holders with almost identical copies that informed them the staff did not care, called buying a meal plan a mistake and told students they would have to live with that mistake. The cards were made by a fourth-year Business major who has asked to remain anonymous, and prefers to be referred to by they/them/their, has provided The Connector with proof of their having created the fake cards. The student explained that while dining services may not come out and say [the dining services] do not care, their actions are enough to prove that they do not. 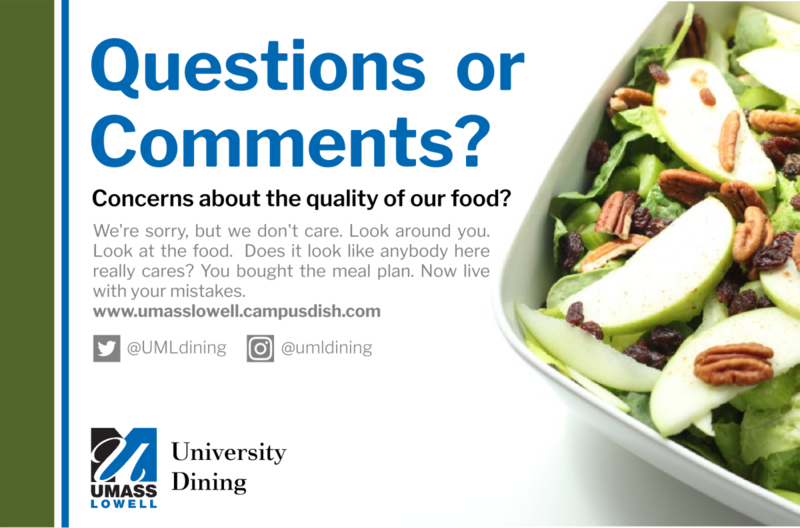 In the student’s four years at Umass Lowell, they have watched the dining halls’ steady decline and have grown frustrated with their customer service. The student explained that they have tried in the past to reach out through the email provided and were meet with lackluster responses and dismissive excuses. “It felt like they didn’t care,” the student said. The student felt the university had further enforced this feeling when the questions and comment cards where pulled from the dispensers near the end of the Fall semester. Ads for better restaurants around campus replaced some, but others were not even replaced, leaving a blank space with the words, “place your logo here.” It appeared to them that students no longer have a place to voice their concerns. The student decided to take the advice of empty slots and used their background in graphic design to create their own cards to replace the missing ones. Their goal was to create a card that at first glance resembled the original card, but upon closer inspection would shine a light on dining services’ true colors. While the student had been aware of the petition that was circling Umass Lowell at the time, they say that they had been unaware of how big it would be. The student’s real goal with the cards was to make a few people smile and maybe grab the attention of the dining staff. The most important change to them is the apparent change in the University’s attitude has toward its dining service. They have noticed a clear message of, “We hear you” and “We do care” in the new posters and at the tables set up in the dining hall. “It’s clear that somebody cares and that was my main point,” the student said, adding that they hoped the positive changes would continue.